As a responsible steward of our members' capital, OPTrust has been working to expand our understanding and spark innovative thinking on the issue of climate change. Climate change is one of the most significant risks facing the world and its complexity requires innovative thinking to find solutions. OPTrust is taking action to enhance climate change-related disclosure, reduce uncertainty in the investing environment and find more efficient ways to manage climate change risk in pension investing. Ensuring that OPTrust's portfolio remains resilient and agile in meeting the challenges of climate change risk is an integral part of our investment mandate in defining a long-term strategy for the fund. 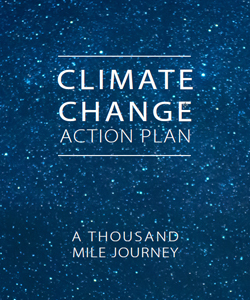 OPTrust’s Climate Change Action Plan (C-Cap) sets out broad actions that we believe will get us there. It defines a clear path forward — aligned with our risk conscious approach to pension management. 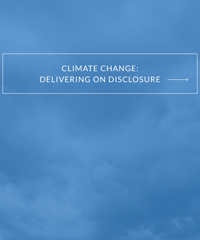 Climate Change: Delivering on Disclosure  details the fund's approach to navigating the complexities of climate change with respect to institutional investing and includes a call for collaboration in the development of standardized measures for carbon disclosure.